OK so the initial controversy over the London 2012 logo has died down. Somewhat. My feed reader is kind of quirky sometimes and I just got retreads on posts from Mack and David on the subject. Despite all of the negative takes on the logo, I think it’s a success. Why? 1. The event is five years away and people outside of London are buzzing about it. Since when did the general public care about the Olympics anymore? I used to work for a sporting goods company and I remember the day that our running marketing manager gave us a hard time about this. Unlike football (i.e. soccer), which people care about every day, all year and which gets much more funding. 2. Can you recall what the last Olympic logo was? Do you even remember where it was held? Can you recall ANY Olympic logos? I remember 1996, because I was living in Atlanta at the time. I remember 1988, because I went to Seoul the year before. Otherwise…? As Oscar Wilde said, "there is only only one thing in the world worse than being talked about, and that is not being talked about." Front page article in today’s WSJ: "You’re a Nobody Unless Your Name Googles Well." The concept behind this has been around – think Classmates.com, which powers its marketing with cyber-stalking principles. There are even consultants who can help you increase your google juice, offering suggestions like changing your name. As the web grows (BTW is there a Hubble’s law for internet expansion?) and search algorithms change, placing well in search results gets more challenging. When I started this blog about a year ago, a Google search for Peter Kim yielded 27.8 million results. Today, the same search yields 43.9 million results! I think I speak for everyone named Peter Kim out there when I say we’re relieved that the result for "Peter Kim: Gay or Asian?" has dropped quite a bit in the rankings. But my favorite search result of all doesn’t show up: The Official Peter Kim Group on Facebook. Hey, I’m not special enough to be in the Nikon D80 blogger program (which I could actually benefit from as I’ve been seriously contemplating a camera upgrade – you can see that my pics are taken with a Canon SD550 or Nokia N73 – but I digress), however from time to time people send me interesting things to read. Steve sent me a copy of Steal These Ideas. Andy sent me a copy of Word Of Mouth Marketing. This week, I got a copy of Chasing Cool by Noah Kerner and Gene Pressman. Read it on the flight from Boston to Minneapolis (where I visited the Mall of America – if Harajuku is an epicenter of cool, this is its antithesis). These guys know what cool is and how to harness it in a business, as evidenced by their experience. The problem is that many people don’t and will read this book hoping to find a secret formula for coolness. Let me save you the trouble – you won’t find it here. Or in any other book for that matter. I’ve been lucky enough to see cool from two perspectives, working at two brands in the footwear industry on opposite sides of the fence. One was cool. The other was chasing it desperately. The problem with the latter is captured perfectly in the quote above the image at left. The secret of the former was its authenticity. As RHCP sang, if you have to ask, you’ll never know. So stick with what you know and have a passion for – that’s what will make you cool. It’s good to hear that Delta Air Lines has emerged from bankruptcy. I’ve flown a lot of miles and many of those have been on Delta (I was a management consultant based out of Atlanta). As part of their re-birth, they’re making some branding changes…which they shouldn’t. I see the importance of making a new start, psychologically. I also see the importance of operating a fiscally fit business and some of the rebranding just doesn’t make sense to me. First of all, hiring a consultancy to design the money wasn’t free. Or cheap. The cost of repainting the planes comes in to play. Delta will save costs by phasing this in over four years – more than enough time for the excitement of the brand’s relaunch to die off. Other airlines like American don’t even paint most of the plane which helps them save in an even more critical area – fuel costs. And ironically, Delta is using more red in their color schemes. As a company emerging from bankruptcy, I’d think they want to use more black. Maybe they do have some customer empathy, or just a sense of humor, reflecting the emotion of their customers for so much of the recent past. Nowhere in their bankruptcy exit statement does Delta say, "we listened to customers." Beyond all the money spent on imagery, I’m hoping that two things change: pricing (lower) and service (better). Otherwise, it’s just a question of when, not whether, Delta comes back to this stage of airline industry samsara. Article in the Richmond (Virginia) Times-Dispatch via Boing Boing that 11 U.S. 7-Eleven stores will be rebranded as Springfield-style Kwik-E-Marts, complete with reverse product placement of Krusty O’s and Buzz Cola. No word on whether the stores would be staffed with their own sleepless Apu Nahasapeemapetilon or carry frosty Duff Beer in the cooler. Taking convergence culture even further, 16 different towns of Springfield are competing to host the Simpsons movie premiere. For some smart thinking on reverse product placement, check out what the minds at MIT’s C3 have to say about it. 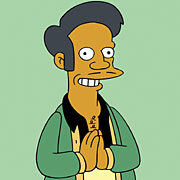 UPDATE: Locate a Kwik-E-Mart on the 7-11 website. Did you hear the big news at Macworld? Yeah, when I heard it I thought, "no big deal" probably just like you. Apple decided to drop "Computer" from its corporate name. People really care about their product brands anyway, like iPod, iMac, and oh yeah, iPhone. The Apple brand serves one (corporate) purpose – the NASDAQ. Have you noticed that there are some brands that the marketing/advertising trade press + bloggers just love to hate? They are brands that operate with a bullseye on their back – seems like they can’t do many things right. Alternately, there are brands that are seemingly bulletproof and can do no wrong, even if they back a step away from "doing no evil." I’ve run this idea by a few people; Brad Brodigan at Biz360 felt that there’s some sort of critical mass/industry presence involved. Joe Chernov at BzzAgent pointed an anti-establishment quality of bulletproof brands. Bulletproof brands: Starbucks, JetBlue, Nike. I think there’s another aspect in brand strategy – low cost, mass brands seem to attract the bullseye instead of high-margin, "premium" brands. Maybe it’s better to have a bullseye than the alternative – to just be ignored. I think this is where Brad’s "critical mass" idea comes in – too big to be ignored but widely accessible, so easily targeted for criticism. Of course not all "bullseyed" brands are blameless – they’ve certainly taken their lumps for recent mistakes. But would the backlash have been as bad if they weren’t in the market position they’re in? Chicken or Egg? "We are not a brand. We don’t pretend to be a brand, and frankly we shouldn’t be a brand" at the AAF conference yesterday. What is a brand? A summary, tag, or shorthand for what a company IS – the products and services it delivers, the features and benefits communicated to buyers, and the personal experience of consumers pre-, during and post-purchase. are losing sight of the real value we are bringing to our clients." Brands allow companies to move beyond price competition – increasing margins and aligning to meet consumer needs of a higher order. The fashion industry is all about brands. Even the ball bearing industry has brands – e.g. Timken is a "premier manufacturer". Procter & Gamble is a brand, although none of its product lines bear the corporate name. If the holding company truly isn’t a brand, then it should disband and act as an investor in the newly independent agencies. And not in a Soviet-style CIS way, either. Let the kids loose and show the world what they can do as nimble independent shops. Thinking about Starbucks recently – reminds me of a theory I have on how brand extensions can work. It’s much easier for a premium brand to extend "downscale" and retain its core/prestige than it is for a mass market brand to reposition itself as upscale. I recalled this after reading a couple of interesting mentions about Starbucks. The first was a post on Laura Ries’s "Origin of Brands" blog, discussing the SBUX distribution of Laurie Berkner DVDs. The other was a news article about increased presence in New England and Northeastern grocery stores. Reminded me of their kiosks popping up in airports and highway rest areas. Taking a quick look at their FY05 10-K, 85% of revenue was derived from company-operated retail, the core of the brand. These business model extensions appear to be successful as the company reports consistent margin and ROE growth since 2002. It seems pretty clear that Starbucks should be a brand to emulate when considering business model expansion; they continue to grow their "core of coolness" (own stores) while monetizing the brand through licensing and alternate retail outlets. So why isn’t anyone crying "foul" or "sell out?" Because the moves make sense and allow them to successfully retain their premium brand while enjoying mass market distribution. Brands RARELY succeed trying to claw their way upscale. More on that some other time.